Let’s face it, between banging bowls, hot pots, and stabbing forks, kitchen tables take a lot of abuse. 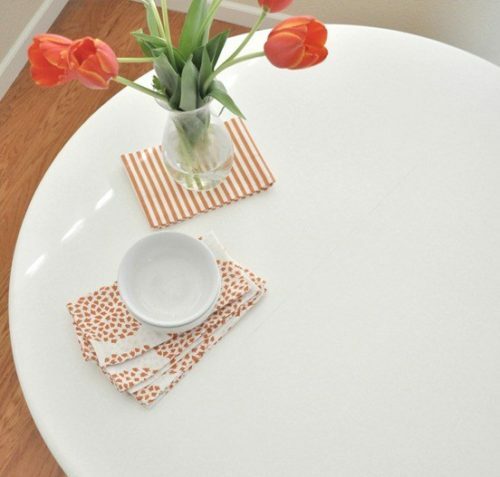 It doesn’t take long for a kitchen table to lose its shine and start to look worn. Luckily, it’s easy to break new life into old furniture with a little paint. But what paint to use? 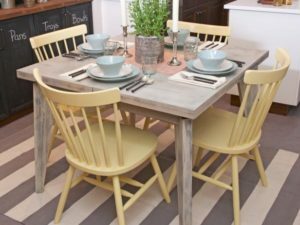 There are four main types of paints you can use to makeover your kitchen table, depending on the look you are going for. I’ll review all four options and you can make the choice. This is the most popular and most common. You can find it at any hardware store. It is water based and comes in nearly any color under the sun. It’s the least expensive option but does require some prep work. Latex is easy to work with, but is often subject to peeling, chipping, and scratching more than other methods. Often, the results of latex paint are directly related to the prep, so if you don’t have the patience to sand, clean, sand, clean, and sand again, you might want to choose another option. Chalk paint has taken over the DIY world in recent years. It made a huge impact on furniture refinishing because it doesn’t require nearly the prep that latex paint does. It finishes in a soft, matte, look and dries really quickly. 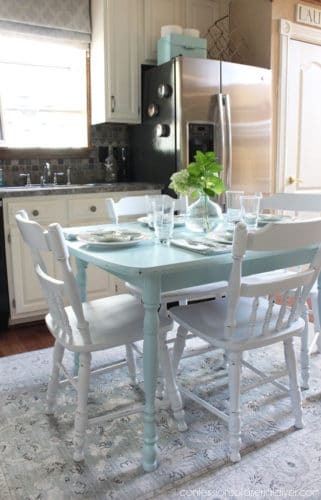 It is easy to create the distressed look with chalk paint, but it its harder to get a silky smooth finish because brush stroked tend to show up more easily in chalk paint as it is thicker and dries fast. If you prefer a more natural alternative, look to milk paint. This is an organic paint made with milk protein. It’s been used for centuries, which makes it perfect for aged, or antique style pieces. It has no VOC’s or chemicals and come as a powder, so you only mix up as much as you need and you don’t have open paint cans in your home. To make milk paint work, you have to use a bonding agent, otherwise it won’t stick to the wood. The wood needs to be sanded well, the bonding agent added, and even then milk paint will often chip, this is part of it’s charm, but you should understand that going in. Acrylic paint is also water-based and often doesn’t require any top coat. It is the most straightforward to use, just a quick sand and then paint. It finishes strong and eliminated brush strokes as it dries, making for a silky smooth surface. It requires a little less prep work than latex, but you should still sand first to give it a good bond. Acrylic paint doesn’t have all the sheen choices as latex, it only comes in an eggshell finish. It can be distressed, but it’s not as easy as chalk or milk paint for distressing. Once you’ve finished painting, be sure to protect your table with a coat of a water-based polyurethane or furniture wax. This is the best way to seal your paint and protect the surface from scratches and stains. Regardless of which method you choose, always be sure to follow the manufacturers instructions and use appropriate safety measures to stay safe while painting. Ready to tackle this DIY project? 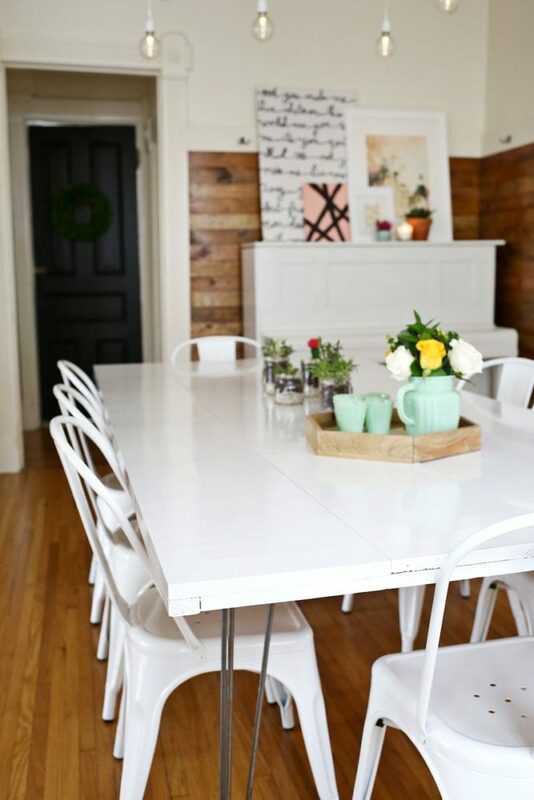 Read this first: The 4 Biggest Mistakes People Make When Painting Their Kitchen Table. If you have any questions or have completed your own painted table, I’d love to see your work! Comment below! I have seen milk paint before! It does have that charm, and the chipping only helps. I would suggest putting a color underneath that also compliments your kitchen’s color scheme. That way, when the paint chips, the aesthetic remains.